We couldn’t have asked for a more successful first installment of Process Reversal Presents, bringing Vancouver-based media artist Alex MacKenzie to Denver for a weekend of expanded cinema on March 18th and 19th. 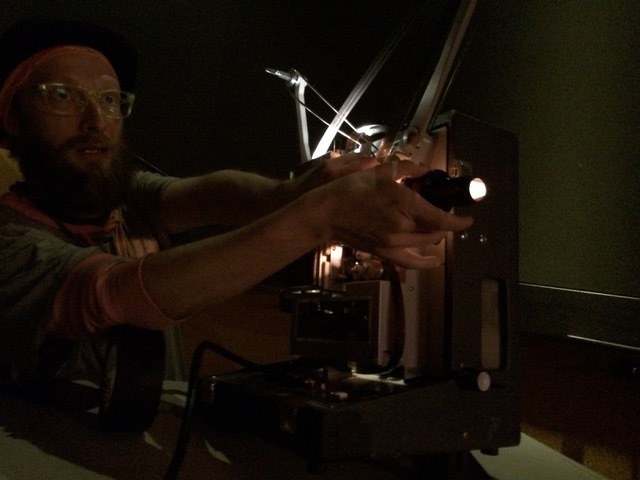 On Saturday morning Alex conducted a projection workshop followed by a Sunday evening screening of his new dual-16mm expanded cinema performance, “Apparations”. 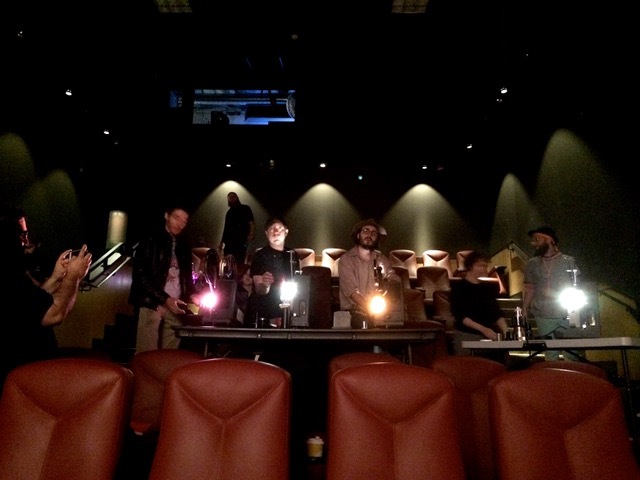 Our newly established collaboration with the Denver Film Society for this series granted us access to their cozy 3-screen cinema, which provided a noticeably different change of pace from the warehouse art spaces that we’ve been accustomed to. 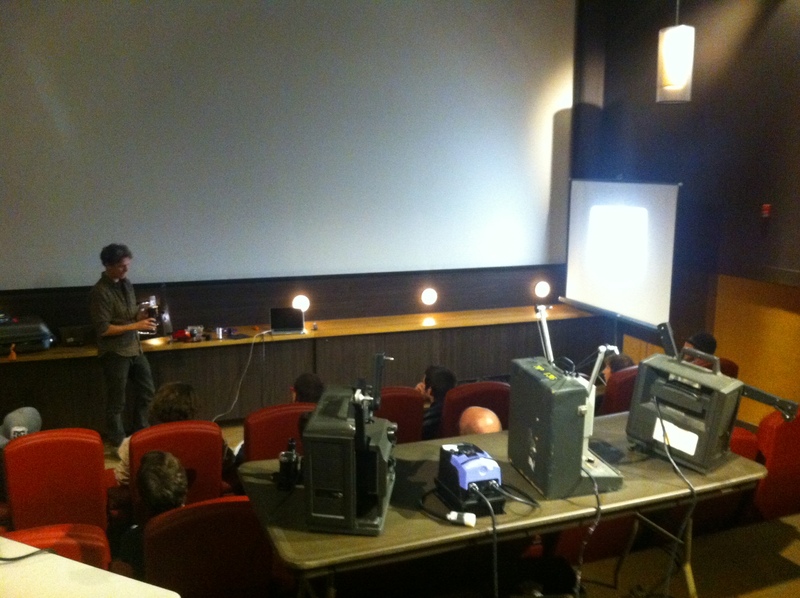 The workshop was attended by a wide variety of people, from aspiring film students to local projectionists to people simply interested in understanding the projection apparatus more in depth. 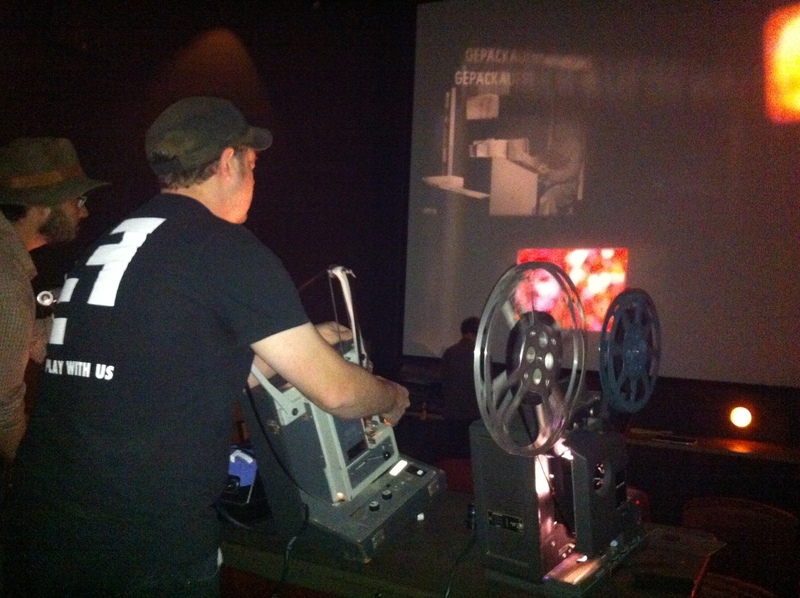 Alex breezed through the various inner workings of the Eiki Slot Load projector that he traveled with and used for his performance. The basic threading, pull down, and take up functions of the projector were demonstrated along with an overview of the motor, film gate, focal plane, optical sound, lens, and removal/replacement of various parts and pieces. Alex then demonstrated the more unusual, fun, and at times nerve-wracking ways to utilize the projector to achieve various effects unintended by the manufacturer. Alex created loops from a variety of campy found footage reels and showed a few different ways to creatively melt the film strip, first by using a Rheostat to slow the projector’s frame rate, but then showing the “poor-man’s” method by simply flipping a piece of single-perf film around so that it wouldn’t register in the pulldown claw. This allowed him to manually pull the film through the projector at whatever speed he preferred, creating a dramatically beautiful, emulsion-destroying, smoke-producing effect. He also showed how the optical sound reader and exciter lamp could be used in various creative ways. 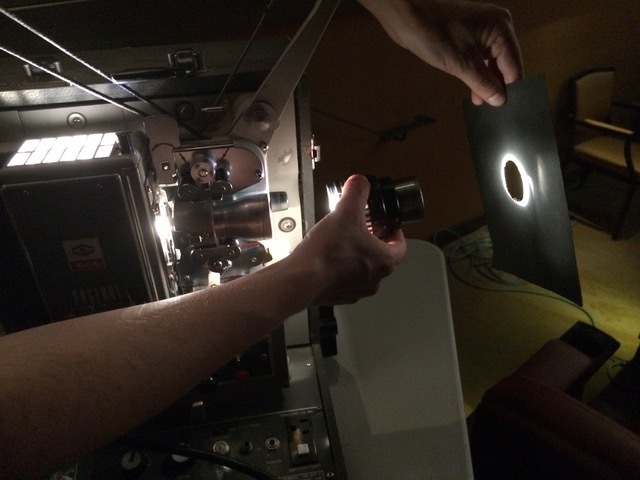 He pulled off the plastic bulb cover and showed how the light from the main projector bulb could be deflected into the optical reader to create some bizarre and spacey sounds with varying degrees of control. 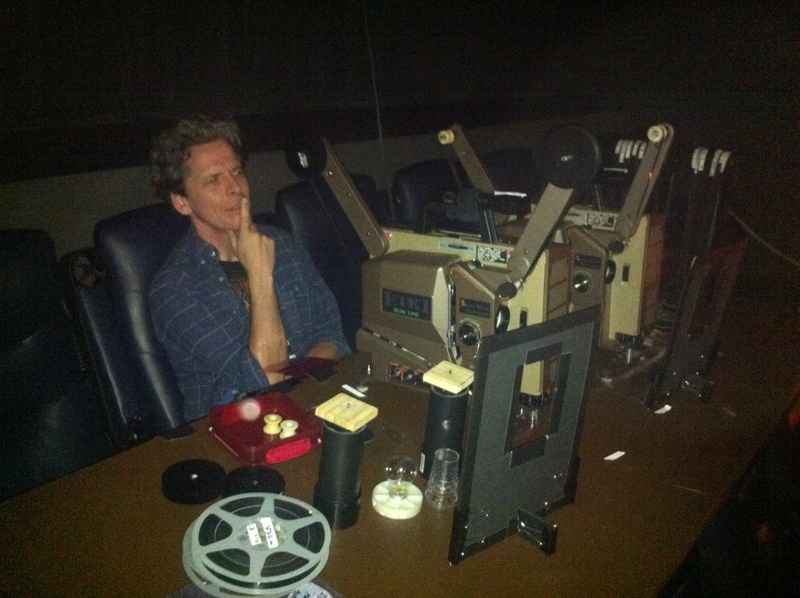 He also demonstrated how a film loop could be “DJ’d” by manually pulling the film strip back and forth through the projector to read the soundtrack either forward, reverse, fast, slow, distorted, or clean. After demo-ing several other unique modifications, Alex also shared his collection of found objects that he uses for front-of-lens manipulation. His collection included everything from homemade mattes, colored gels, to things as random as an incandescent bulb attached to a rotating motor that, when placed in front of the lens, produced an entrancing and ghostly halo accompaniment. He also showed how something as simple as putting your hand in front of the projector could produce unusual and striking visual additions and transitions to a performance. Alex then opened the floor to all 12 participants to get their own hands dirty. 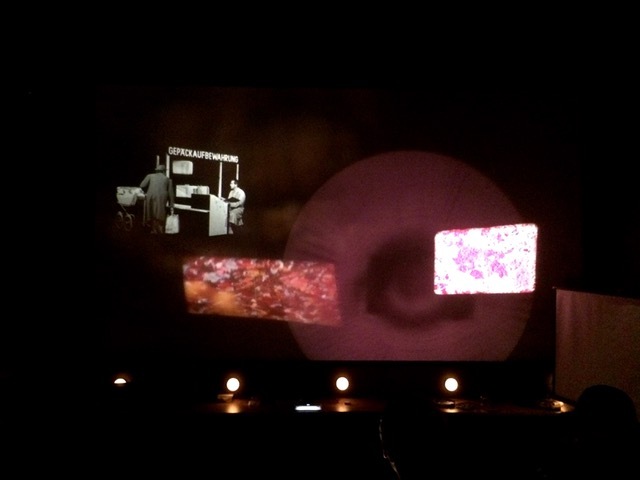 Five different projectors were set up and people were allowed to play around with creating loops, front-of-lens manipulation, alteration of projection speeds, and sound manipulation, creating a cacophony of sound and images on screen. Alex’s performance of “Apparitions” on Sunday evening created a well rounded end to the weekend. The performance was mystifying and encompassing, and Alex showcased many of the techniques that he taught during the workshop. The 60+ people in attendance engaged in a lively discussion following the film with questions of all varieties. It was a fascinating juxtaposition having larger indie/sub-blockbuster films like “Get Out” and “Donald Cried” playing in the other two theatres simultaneous to Alex’s more subtle and minimal experimentations. It was serendipitous to be able to catch Alex on the tail end of his 2017 US tour for our first PRP installment because he provides the exact type of experience that we’re trying to achieve with this series. 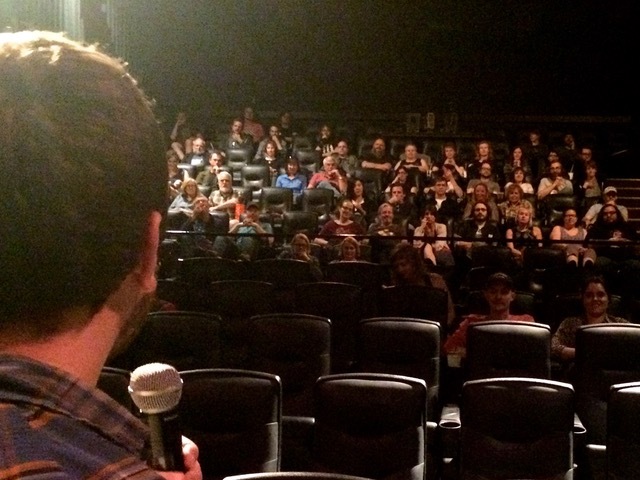 The goal in our collaboration with Denver Film Society was to reach out to people who are not as familiar with experimental media and provide a unique and inviting experience for them. We wanted people to engage with this type of film through a multi-faceted experience, one that would include an interactive educational workshop mixed with a more classical type of screening, in hopes to contextualize the process-driven cinema that so many contemporary film artists create and present. Report: Handmade Emulsion with Sight Unseen HAPPY BELATED WORLD PINHOLE DAY!